I sometimes can't help but feel a little apprehensive vis-à-vis our lives becoming a wee bit too easy and comfortable thanks to miraculous recent advances in technology. Creepy human highway scene in Wall-E, anyone? We love our smartphones – and, admittedly, some of us are absolutely addicted to them – but we’d like to remain at least semi-smart and preferably physically autonomous ourselves, thank you very much. So without wanting to sound like I’ve become totally lazy and dependent on my gizmos and gadgets—I have to confess that sometimes when I’m working on my computer I kind of don’t feel like getting up to check my phone for incoming text messages. I was at my desk the other day thinking just that, so I decided to do a quick Market search for an application that would allow me to access my phone via my computer. What I came up with is Remote Web Desktop Full. We tested Remote Web Desktop Full on a rooted HTC Desire; please bear this in mind as some of the application’s features will only work on rooted devices. The first time you start up the app a no-nonsense style menu explains the different functions, some of which are quite comprehensive. The menu is split into three columns, of which only one truly relevant to the ‘remote web’ aspect. ‘Web Desktop’ enables you to establish a connection between smartphone and computer, allowing you to remotely control the former. 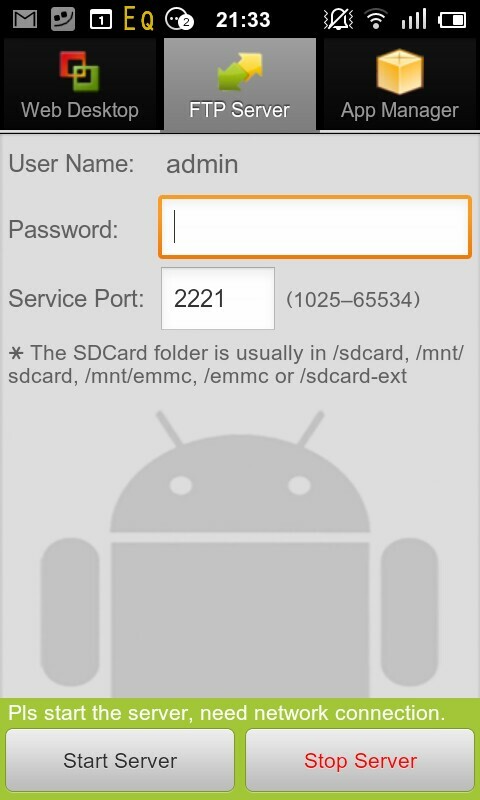 ‘FTP Server’ lets you set up a server and ‘App Manager’ lists purchased apps. If you decide to set up the FTP Server: it’s stabile and efficient, but it isn’t a full spectrum FTP server—it simply does not have enough settings options to fulfill that criterion. You can use the App Manager to back up your apps, though like with the FTP server it isn’t as thorough as some free apps that are available specifically for that purpose. Now that that’s covered, let’s get down to the core feature this application has to offer: establishing a connection between phone and computer. The first thing I noticed during the set-up: a computer client isn’t necessary in order to access the phone; just enter an IP address and the two devices will connect. You will then see a sort of desktop (called DroidTop) harbouring more features and options such as 'Messaging', 'WiFi Keyboard' and 'WebCam'. The first one is fairly obvious: it lets you access text messages stored on your phone, as well as send new texts, provided you allow the application to create new text messages. If you want to write texts using a keyboard hooked up to your computer select ‘Wifi Keyboard’. ‘WebCam’ is certainly the feature that intrigued me the most. It transforms your smartphone into a webcam for your computer, which is super convenient for users who don’t happen to have a webcam. You can even select whether the front or back camera is to be used and whether you want to allow access to providers such as Skype or Google. If you’re looking to swap data but not via the FTP server try the ‘File Exporter’, which I used to export some music to my smartphone, wireless and easy as pie. Amidst the numerous features my personal favourites are 'Screen Capture‘, 'Terminal' and 'Remote Control'. You can probably guess what the first two features do, but let me share my thoughts about the third. This feature is only suited for root users! And it’s lots of fun. Install the little ad-on and you will be able to control your phone via your computer. Ah, the apotheosis of lazy-tude! Despite my obvious enthuse for this feature I do see a few aspects worthy of critique, the first of which is security related to network connection. You can secure a network using a password, but it isn’t foolproof. 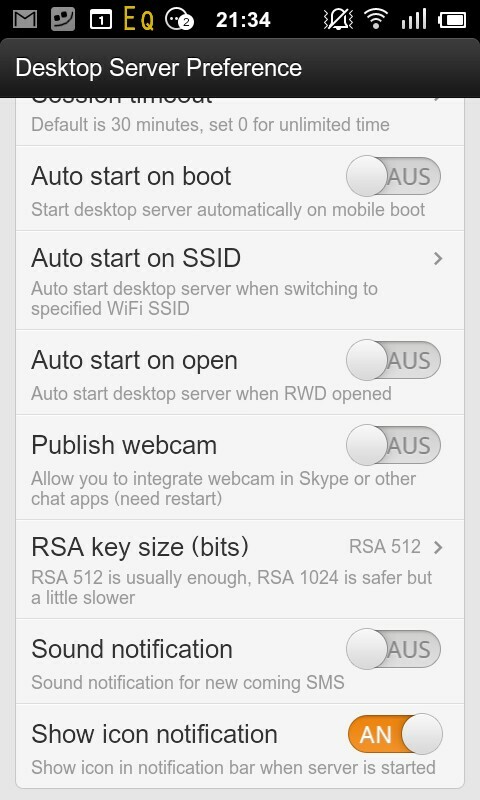 Also, SMS syncing is a bit slow. Top marks for Remote Web Desktop Full—it’s a truly exceptional, dare I say must-have application for root users. Sure, the FTP server isn’t top banana and no one really needs the app manager, but those are more like little bonus features rather than what constitutes the app’s core. The application will expand your smartphone’s functionality as well as establish a connection between your phone and computer. Syncing, data transfer and – if for root users – remote control use—that’s a well deserved five star rating in my book. Remote Web Desktop Full’s controls and graphics aren’t the bee’s knees. As far as graphics go, well, we’ve seen prettier menus. We noticed delays in the display between WebCam and Remote Control that weren’t related to the network. Remote Web Desktop Full performed very well throughout our test runs: both fluid and fast. 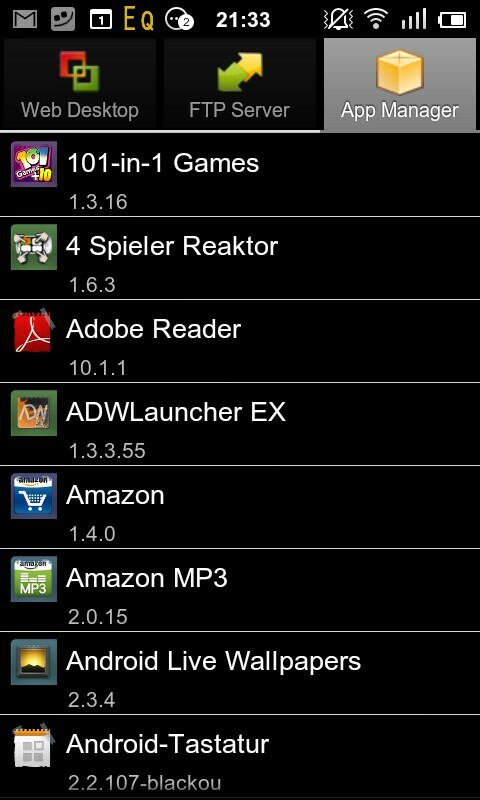 Remote Web Desktop Full can be downloaded for EUR2,99 from the AndroidPIT App Center, free of ad banners of course. The application is well worth it, especially for root users. 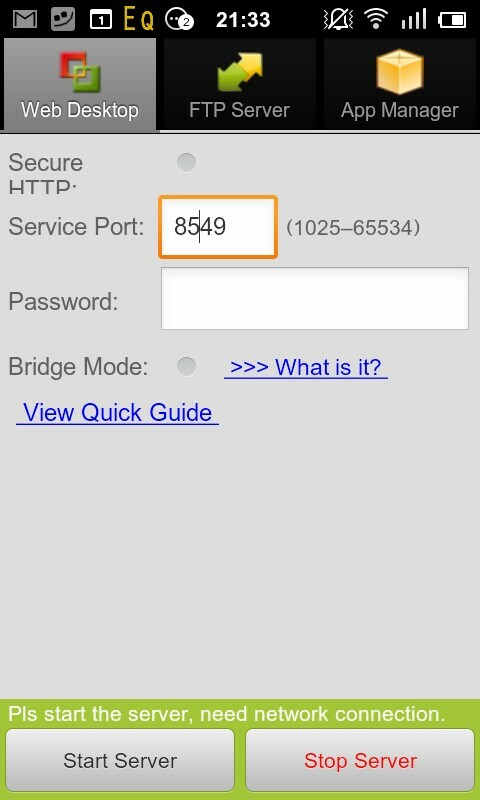 It's a useful application to control the PC on your phone. Thanks for sharing your thoughts, Rocky. I agree with you that the side features are not vital, but nice little bonuses for those who like them. I've been using this app for some months now and mainly for writing sms from my desktop pc (like I used to with Nokia PC suite). It's really nice to work with, given some hickups every now and then in terms of UI but the great thing is that the dev is giving fast reaction when mailed. A really must have for root users! Just as a sidenote: I hardly use the other features e.g. webcam, contacts since it just ain't my use case.